I mostly just wanted to marvel at my own serendipitous timing. I happened to post my own review of the book on Monday... which happened to be the day the dogpile hit the fan for poor old Jonah. The very same day, as a matter of fact. I guess I was just clairvoyant on the timing - I could smell the controversy in the air. Tablet magazine uncovered that Lehrer had outright made up quotations from Bob Dylan in the early chapters of the books- the ultimate journalistic no-no. Not to mention the fact that he chose to do this to one of the most iconic and obsessively loved figures of our time - did he really think no one was going to sniff that out? On top of the "self-plagiarism" allegations that emerged about a month ago (which I chose not to mention in my original assessment, in an effort to give Lehrer the benefit of the doubt), Lehrer's reputation is pretty much in shambles at this point - his publisher's have even pulled the book from stores, making my links in the original review moot. I guess I should hold onto my copy, as it is now an artifact of journalism gone very wrong. What do we say about an author who has so clearly gone astray? Well, probably a lot of the same things that Oprah said to James Fry. Or Ira Glass said to Mike Daisy (BTW - there is no force more terrifying than the terrible fury of an Ira Glass spurned). People mess up - they want to make a grand point and instead of doing the hard work that sticking to the facts often requires, they take short cuts. They create what they need to be able to say "finish" and then hope that their charm and powers of persuasion can override any dissent. What's sad in all of the cases I mentioned is that by adding some simple clarifications, these storytellers could have more or less made the same point without having their message undermined. 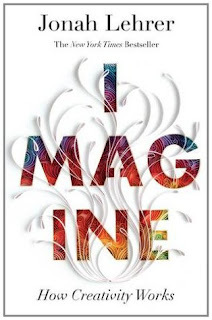 Imagine is no less a thought provoking book for not having those Dylan quotes, or even for not having a lot of hard science in it. It's still an interesting case study compilation that gets at a few interesting questions about the creative process. That makes Lehrer's decision to lie all the more sad. What do you think of the latest crazy literary/journalistic rodeo?